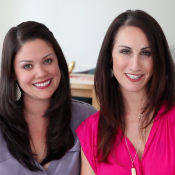 Driver Digital launches a new show with design duo Melisa Fluhr and Pam Ginocchio of ProjectNursery. The show, entitled “Project Nursery”, focuses on design in and around the nursery and will offer expert design tips, DIY projects and trends inspired by contemporary furniture, gear and decorative accessories for “baby’s first room and beyond”. Project Nursery will work exclusively with Driver Digital to produce the show on location in New York City. Since 2008, The Project Nursery brand has flourished via ProjectNursery.com where their engagement is impressive, capturing over 2.1 Million page views each month from 300,000 unique visitors. Their newsletter, with 15,000 subscribers, is complimented by 25,000 fans on Facebook, and Twitter with nearly 8,000 followers. Longtime friends, Melisa and Pam moved to New York City after graduating college to pursue careers in sales and marketing. Both, who found themselves married and expecting, had always been design fanatics and traded hundreds of emails about nursery design. Their visions were celebrated when Melisa posted pictures of her son’s crib to HGTV’s “Rate My Space”, which received overwhelming interest. The massive amount of online commentary planted an idea to create a platform for nursery design discussion, debate, and advice; Project Nursery was born. The duo curate ProjectNursery.com along with their team of 12 experts specializing in interior design, architecture, art, party styling, maternity fashion, and photography. Their website hosts a blog that is updated several times daily and offers baby, child and family design-related products and services, along with online resources that offer product reviews, how-to’s, videos, a nursery checklist (so that no corner is overlooked) and the “Find a Designer” tool arriving shortly. Melisa and Pam also appreciate each new mother’s vision, and true to their roots, their website promotes a dedicated community through the user generated Project Gallery, where young mothers have the opportunity to showcase design projects and receive input from the Project Nursery Community. Driver Digital welcomes Melisa, Pam and the Project Nursery experts and contributors to our network.